PTab is a fully functional spreadsheet with the key features of desktop spreadsheets: Microsoft Office Excel & Windows Mobile Excel compatibility, macros, charts, data validation, dropdown boxes, outline etc. Also available as a part of Smartphone Office bundle with Osymo Smartphone Text Editor. 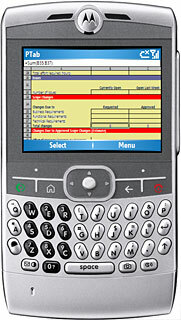 PTab is also available as a part of Smartphone Office Bundle with Smartphone Text Editor.